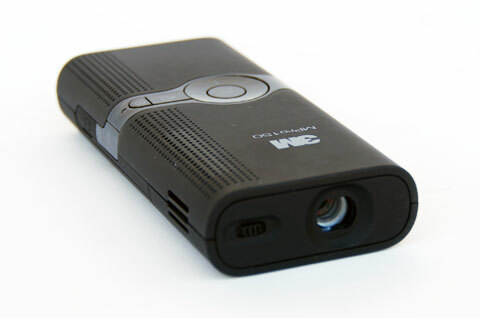 While early pico projectors were very rudimentary, some of the latest products like the 3M MPro150 are changing people's expectations of what a pocket-sized projector can do. The MPro150 is truly pocket-sized, but produces a 15-lumen picture with good color saturation and contrast that's perfect for a mobile presenter who wants to travel light. A gigabyte of internal storage and a MicroSD card slot make it easy to present without wires. But the MPro150 can show more than just pictures - it features support for Microsoft Office documents as well as Adobe PDFs and several common video formats. With a street price around $380, the MPro150 is a presenter's perfect pocket-sized pal. Image quality. The MPro150 is rated at 15 lumens, and our test sample measured 14. The image is clear and bright in a dark room up to about 40" diagonal, where it begins to dim rapidly. In a brighter environment, the "sweet spot" for projection seems to be about 15" to 20" diagonal. In terms of actual image quality, the MPro150 is bright enough to hold its own in a well-lit room, provided you keep the image size reasonable. Contrast is sufficient for Word or Powerpoint documents, while images and video will benefit from more restricted lighting conditions. There is some vignetting in the corners, which can get annoying when displaying text documents, since important information can run from edge to edge. For Powerpoint or photography, though, it should not cause too much of a negative impact on your presentation. Wireless presentation. 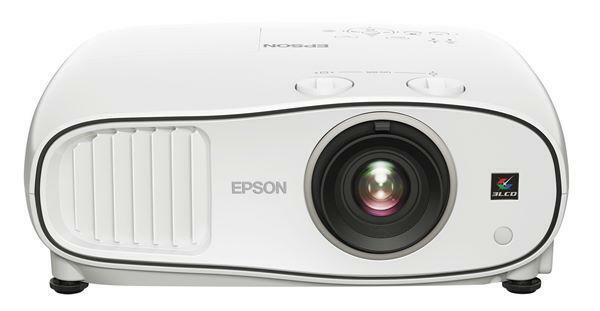 The MPro150 is more than just a projector. Traditionally, projectors are more like computer monitors than televisions, in that they need an external source to handle the decoding and playback of content. This can be anything from a DVD or Blu-ray player to an iPod or laptop. The MPro150 is different, because it does not require an external source for several common document types. Since many, many presenters use Microsoft's PowerPoint software for their presentations, the MPro150's Office support will allow them to run their presentations directly off the projector without having to run a single wire. The MPro150 can also handle Adobe PDF documents, image files, MP3 music files, and several common digital video formats, including MPEG-2 and various MPEG-4 implementations. No matter what we threw at the MPro150, it displayed it like a champ. Navigation is not as fast as it would be on a laptop or netbook, but if all you need to do is display a file, the MPro150 is more than capable. Storage. Of course, the ability to display all of this data is useless without some place to put it. The MPro150 has a generous 1GB internal storage area, accessible via USB. Simply connect the projector to your computer and it will show up as USB storage, similar to how you use your digital camera or USB thumb drive. Note that the projector must be turned on in order to access its storage space. Now, if you are going on an extended trip, it is possible that 1GB is not enough space for what you want to display - especially if you're using a lot of video or photographic content. The MPro150 has a slot for MicroSD cards, and includes a 2GB card in the box. These 2GB cards can be purchased for less than $10 each and are smaller than a dime, allowing you to carry effectively limitless storage that is easily swapped in and out of the projector. This would allow you to keep a card for your business information and then another for movies to watch during your flight, for example. I am having problems with the resolution. I am unable to see the picture clearly through projector on wall. The picture or presentation is OK on my monitor. How to resolve this issue. Kindly help me in this regard. you will not get a perfect picture on a wall. use a projector screen. This is a lousy projector. My office purchased it for me when doing word document presentations. The light output is so poor that I have to turn the lights down very dim on order to see the picture. You cannot have this projector in a room where there is a window or lamp. Perhaps the most annoying problem with this projector is the image. The advertisement shows that this is a widescreen projector. It is not, it shows up as a square. Also, it only shows part of my screen at a time, and I have to move the mouse around for everyone to see the whole document. What good is a projector that only shows you part of the screen at a time? If there was a five star rating system, I would rate this a 1, only because it is cute, quiet, and portable. The image was weak further than 8 feet from the screen in a room with minimal lighting, however it worked quite well in complete darkness at that range. The interface & menus were simple, yet too limited to get true image control. After much tinkering and only getting a partial image projected as a dim trapezoid, we considered it useless for office or meeting use. Great concept though, and quiet. Would be excellent to have as a personal projector for when you want to stream movies off your phone in a dark room. 640X480 is insufficient resolution for document use. I'll wait till a newer model comes out that handles at least 800X600 and more video formats. Still, this is a nifty product adequate for movies and slide type presentations, should be great for Powerpoint if you don't over stuff the visuals with fine details. Can't see how this would be useful on an airline tray though.